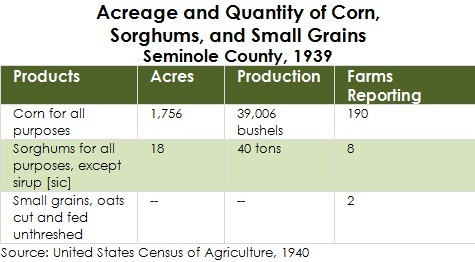 Aable representing acreage and quantity of corn, sorghum, and small grans in Seminole County during 1939. Statistics in the table identify various products produced in the county, how many acres each crop occupied, production number of each crop, and the number of farms reporting for each crop. In the early-1900s, Seminole County was known for its agricultural development and close proximity to shipping lanes. By the 1920s, citizens in Seminole County, particularly in Sanford, soon shifted their interests in making the area a tourist destination. Original table by Laura Cepero, July 20, 2011. United States, and Zellmer R. Pettet. Sixteenth Census of the United States: 1940. Agriculture. Washington: U.S. Govt. Print. Off, 1942. Cepero, Laura. 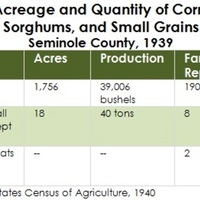 “Acreage and Quantity of Corn, Sorghums, and Small Grains, Seminole County, 1939.” RICHES of Central Florida accessed April 22, 2019, https://richesmi.cah.ucf.edu/omeka/items/show/3106.